The Connecticut Department of Transportation is calling it quits on a controversial guard rail that transportation officials say may have contributed to at least seven deaths around the country. The Connecticut Department of Transportation (DOT) is calling it quits on a controversial guardrail that transportation officials said may have contributed to at least seven deaths around the country. None of the fatalities reported were in Connecticut, but state DOT officials said they are not taking any chances. One father from Tennessee has made it his mission to keep other families from suffering and to stay safe. Steve Eimers’ 17-year-old daughter, Hannah, died Nov. 1, 2016. "Her injuries were so catastrophic we never saw her again. What a guardrail coming through a car does to the body is horrific," Eimers told the NBC Connecticut Troubleshooters. Eimers said he has reached out to every DOT in the country in memory of Hannah. Eimers said his daughter drove her car off the road and was fatally impaled by a guardrail end terminal called X-Lite made by the Lindsay Corporation, based in Omaha, Nebraska. "It has to come off in an urgent, in an almost emergent manner, when it impacted it kills and maims," Eimers said. Eimers said he won’t stop until these federally certified guardrails are all gone. Connecticut is joining several other states in removing the Lindsay X-Lite end terminals from some of the state’s more rural roads. There are currently 13 in the state that were installed within the past two years; Two are in Mansfield, four in Somers, one in Union, two in Bloomfield, one in Berlin, one in Pomfret and two in Thompson. "We can’t tell you specifically how the product is going to perform. There are a lot of questions about its performance, not a lot of answers about its performance good or bad. And that level of uncertainty poses a problem for us. So we’ve decided to go out and proactively remove the 13 we have," Kevin Nursick, a spokesman for Connecticut’s DOT said. "There’s a lot of gray area at this point, we don’t have the answers in terms of what the performance is going to be when you have that amount of uncertainty on our part. You just can’t, we just don’t want to take the risk, so it makes sense for us to go out and remove the limited number of these that we have 13 out of the roughly 1,200 end treatment terminals around the state of Connecticut, only 13 are in question," Nursick explained. The Federal Highway Administration told the NBC Connecticut Troubleshooters that beginning in 2018, federal aid won’t pay for the X-Lite end terminals because they don’t meet their new safety criteria. "Lindsay Transportation Solutions builds road safety equipment that reduces risks for drivers on America’s roads. Lindsay proactively offers a variety of training resources to help states and contractors with proper hardware installation and maintenance, such as road safety tours, a mobile app available in four languages, and onsite training. While X-Lite has successfully passed crash and safety tests in accordance with Federal standards, there is no road safety equipment that can prevent injury every time a driver fails to stay on the road. When properly installed and maintained, roadside hardware like X-Lite will reduce the number and severity of injuries sustained in car accidents. Lindsay continues to work collaboratively with road safety stakeholders on national initiatives to enhance safety on America’s roadways." Eimers hopes no family ever has to face another fatal accident. "Yesterday, CT DOT called me and told me they are the tenth state who would be removing this device from the roadside. That is unprecedented," Eimers told the NBC Connecticut Troubleshooters. Connecticut will remove the Lindsay X-Lite end terminals in spring and summer. It could take up to $5,000 each to remove and replace the terminals. "Safety is the top priority of the Federal Highway Administration, and we remain committed to reducing fatalities on our nation’s roads. No family should suffer like the Eimers family has. 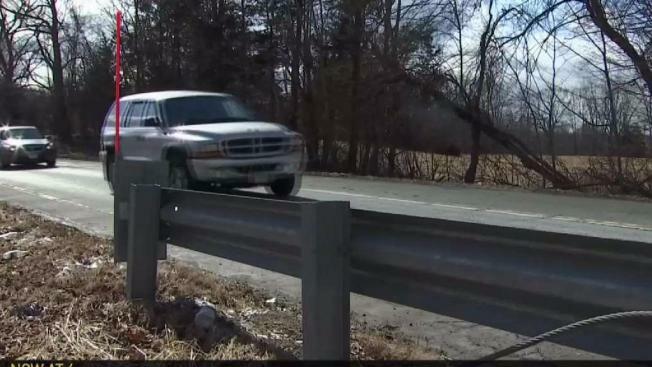 Beginning in 2018, federal-aid reimbursement for roadside guardrails will be contingent on these devices meeting the most recent safety criteria developed by all state departments of transportation," Federal Highway Administration officials told NBC Connecticut by email.